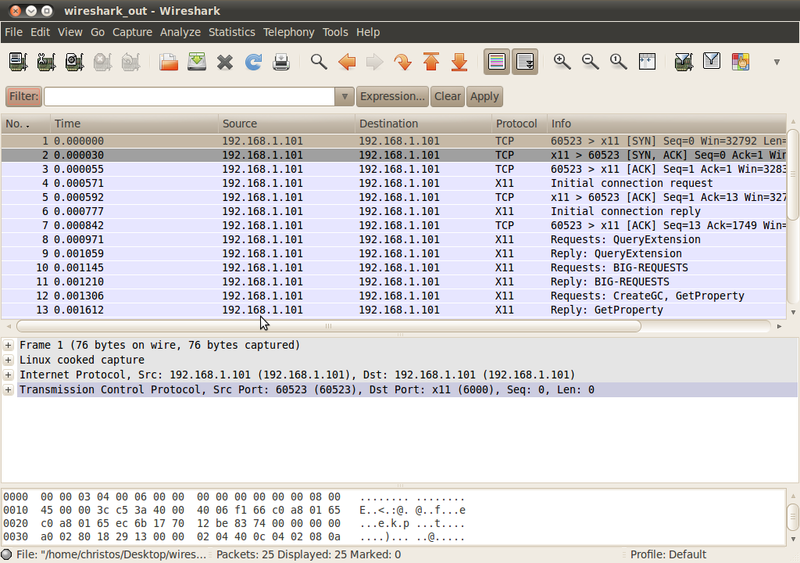 Wireshark is a network protocol analyser. We will use this utility to have a closer look at the packets exchanged between the X Client and X Server that make the read-writev triplett that as we mentioned previously make the initial negotiation and as an outcome many of the Display fields are filled. At the Wireshark Capture->Options menu option we set 'Interface' to 'Pseudo-Device that captures all interfaces: any' and at the 'Capture Filter' we enter 'host 192.168.1.101', which is the IP address of the system used. We set also the 'Stop Capture ... after' to a small number of packets, e.g. 12 and we start monitoring with the 'Start' button. By double clicking to this packet area in the Wireshark pane we open it to a new window. As we see the byte-order is Little-endian, the protocol major version is 11 and the rest of the fields are zero or unused. 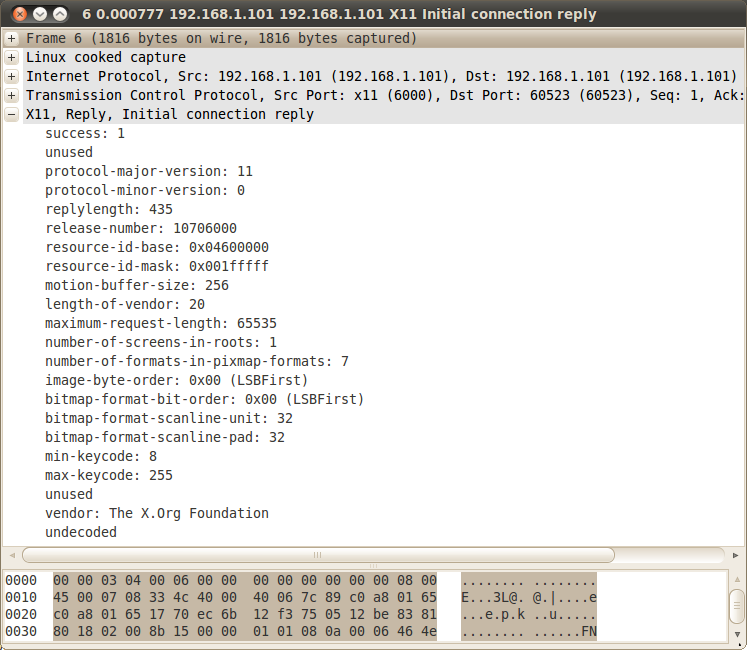 As we see Wireshark has the ability to recognize the X11 protocol messages. For instance value 11 corresponds to the 'protocol-major-version'. For a complete list of all X11 messages that Wireshark recognizes read this wiki. The two successive writev() calls of the X Server, are placed now in the same packet. The replylength value corresponds to the 1740 bytes of the second read(). This is 435 and the result of 435 * 4 is 1740. As we read in the xConnSetupPrefix definition 435 is "1/4 additional bytes in setup info". Since xConnSetup is only a small portion of the 1740 bytes of the second read() call we have to find the value of the rest. Those are the values that correspond to the u union members, discussed at the first part of the current section and the only member value that is displayed is of vendor, which is 'The X.Org Foundation'. The rest are left as undecoded. Wireshark shows those bytes in hex values and we could make some decoding in the hard way, however as we see in the next section xtrace gives us this info readily.